Full time .NET and Java Developers who recently graduated from a highly selective (only 8% get into the program), intense, full-time boot camp with more coding experience than most 4 year IT Majors get from Universities. The students average age is 29 therefore they have experience as an employee, industry experience and most have college degrees in other disciplines (some technology). 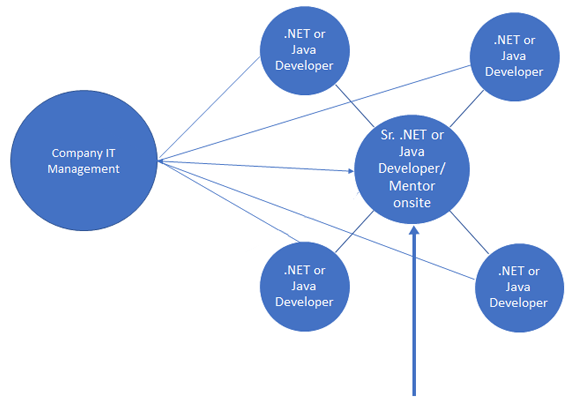 Mentors are Senior Developers who work with both Company Senior Management and Junior Developers to Acclimate the Developers to your environment and Mentor them for 6 months. Mentor works full-time reviewing all completed code, has daily meetings with developers and frequent meetings with Company IT Management.